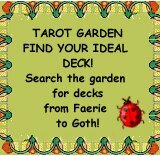 I’ve tried very hard to get into the Lenormand craze that has taken over the Tarot world in 2012 (and is set to do so into 2013), but I found it very difficult. For starters, I’m an aesthetic girl: I like things that look exceptionally pretty, I enjoy sumptuous images filled with detail and bold colours. Most Lenormand decks just don’t excite me. 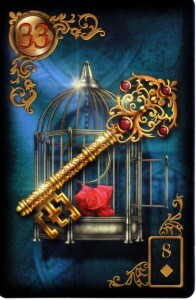 But then along came the Gilded Reverie Lenormand by Ciro Marchetti, and I’m a convert. These luxurious, deep, colourful and clever images, printed on cards larger than the usual Lenormand size, draw the reader into their landscapes and offer them what are undoubtedly the best edition of traditional Lenormand cards to date. the Gilded Reverie one pair is more romantic, each holding a single rose and looking dreamily at the other, whilst the other pair is more sexual, each almost bare-breasted, sporting tousled bed hair and intense expressions. It is suggested that a reader could deliberately use two Gentleman cards or two Lady cards in a reading for a gay or lesbian client; as an extension of this one could conceivably use all four, or three of them, for a poly-amorous relationship, or utilize three of the correct gender for a situation in which there is a choice to be made between lovers… These optional cards are a great addition to the Lenormand, bringing it more into the 21st century. On a personal note, I am very pleased with the addition here, because all of the Gentleman and Lady cards are beautiful, and I’m sure I’m not the only person who will stop at the more sexual Gentleman card and have a minor heart palpitation. We are also given four extra cards (numbered 37-40) to use if we wish: Time, Bridge, Dice and Mask. Although there is no companion book that arrives with the deck, a .pdf version (in full colour, 59 pages) is available for free to download from Ciro’s website. This companion book gives information on the extra cards, as well as telling us that it is only a series of chance events and geographical/chronological bias that made certain cards a feature of the final Lenormand template used today instead of others. This book, put together using key points provided by Rana George, and additional summaries by Tali Goodwin of Tarot Professionals, with information from Ciro as well, is highly recommended for use alongside the deck, since it is full of Lenormand history, how it developed, and interesting facts about the tradition. 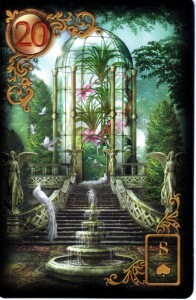 It also gives in depth meanings for each card, including what they might mean in a few combinations together with other cards in a reading. I was pleased that the Gilded Reverie shows the playing card association on each card, since I find this to be a useful correspondence in the tradition; however, those who like the appearance of the short poems (such as in the popular Mlle. 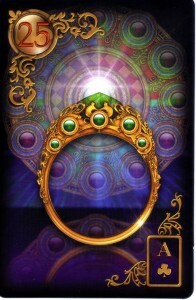 Lenormand Fortune Telling Cards by US Games) will be disappointed. However, including these would have done a great injustice to the card images, which are opulent, detailed, striking and, in places, very Steampunk! (I approve of Steampunk greatly. Check out Ship -3 – and Book – 26 – for some examples of the cogs and machinery working its way gently into the Gilded Reverie.) Anybody remotely familiar with Ciro’s work will instantly recognize this as his, bearing his distinctive style that is a mixture of naturalistic, cosmic, fantastical and mechanical, all presented in the jewelled, bold colours of a carnival. There are nods in the Gilded Reverie to other occult teachings, such as the appearance of the Kabbalistic Tree of Life on the Tree (5), and the zodiac signs on the Stars (16) and Book (26). 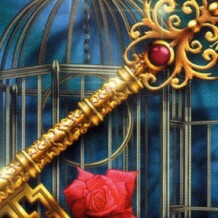 Those in the know might also be pleased to find the mystical Rose and Key as companions on the Key (33). Other intriguing and well-thought out details include the actual content on the Letter (27), which is written in French (mine is poor, and I gave up trying to translate, but I’m sure it is something very interesting.) As an added bonus game (I used to enjoy doing this as a child), Ciro’s initials can be found in every card, hidden somewhere. I spent a good while searching each image for them, but then I am easily entertained. 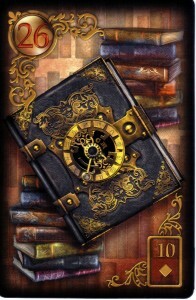 To make this deck even more collectible and unique, Ciro comments in the companion book that several of the cards have different colour schemes for their images, and that during assembly the different versions of each card were randomly assigned to each deck. He says, “The chances of anyone else having an identical combination of colored cards as you are more than 1 in 8000.” (pp. 14) For instance, my House (4) has a purple roof, but I have also seen one with a red roof; my Ring (25) is set with emeralds, whereas the one featured in the companion book is set with rubies. This is a clever idea, and one I have not seen done before in any deck – one of the beauties of self-publishing! The only downside of the Gilded Reverie is that due to the card stock, the deck arrives slightly warped (the cards all bend upwards at the top and bottom.) This can, however, be solved with heavy books, and it is just one of those things that happens with certain card stock. I also noted that the images seemed darker in the deck than in the companion book, though I wouldn’t have had a complaint about it until I had compared with the book. Finally, I would be concerned about the hardiness of this card stock against frequent use. Black borders might become scuffed and reveal white, and this card stock, not being glossy and protected as much, might suffer from the everyday dirt of hands and shuffling. However, I also have a solution for this: buy two copies of this marvelous Lenormand deck – one to keep in pristine, collectible condition, and the other to read with! And there’s the rub: if you get the Gilded Reverie Lenormand, you won’t want to put it on a shelf in your collection; you’ll want to read with it, thumb through it, salivate over the images, show others, and maybe put a certain Gentleman card in a picture frame on your bedside table… But at the same time, it’s not the kind of deck you want to throw in your bag and carry around everywhere with you. This is a deck you keep reserved for special readings, for readings for yourself over a glass of wine while listening to your favourite music, a deck to read accompanied by your favourite meal. 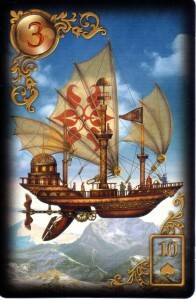 This is a deck that you should allow to seduce you into the Lenormand tradition, to wine and dine you with its intricate images and carefree beauty, and it is a deck that will take you by the hand and place you, alongside countless other Tarot and oracle enthusiasts, in that long line of cartomancers and oracle givers, starting – as legend would have it – with that famous French card reader Mlle. Lenormand. Available from artist’s website here.